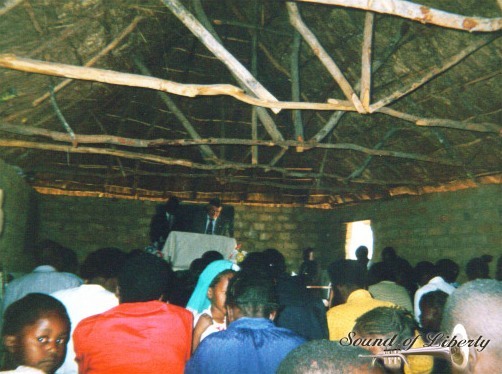 In 2002 I had been asked to come to Zambia to preach in meetings there that would be starting that July. I had been seeking the leading of the Lord on this, as to whether I should go or not. I had just come off of my second 40-day fast. My wife told me that we needed to make the plane reservations so that if we did go we would be able to get tickets for the flight. So I told her to go ahead and make the reservations, even though I didn't have the leading that I felt I was needing in order to make the trip. So we waited. It was getting close to having to pay for our tickets because they would no longer hold the reservations without payment. So I told my wife to go ahead and cancel the reservations, because I hadn't gotten anything from the Lord concerning this. So she canceled them. That night the Lord gave me a dream, and I was in the spirit watching the following take place. In this dream, I was at a certain place and noticed bees, honey bees, and every once in a while some would go by. They were going in no certain direction and they had no other purpose; just flying. Then there came a man and a woman, side by side, out of the woods and they were carrying a honeycomb. It was about 30 inches square. I noticed again, that the bees were just going every which way, in no certain direction. As the man and woman came out into a clearing, they raised the honeycomb up. The bees would fly by occasionally, but it didn't seem to have any effect on them. Then the man and woman began to tilt, or slant, the honeycomb back, and when it reached a certain degree they stopped and bees began to come out of the woods. They came to that honeycomb by the thousands. The bees absolutely covered that honeycomb up! Then I woke up. I spoke to Brother Sam Francis about the dream and he said that his father once told him that honey is the only pure food there is and it can't be duplicated by science. They can't make honey. The point being, those bees came to it when it was slanted just right. We have to get the right slant on the gospel of the Lord Jesus Christ in order to attract the real seed of God. I preached a message about this called "Having the Right Slant on the Gospel". The next morning I told my wife to call and get us a flight to Zambia. She called our travel agent and the flight that we had cancelled still had two seats left on it. We flew into Lusaka, Zambia, and then went to Kalomo for the meetings. While we were there, one of the saints there had a dream. In the dream, there was a table covered with a white cloth in front of their pulpit. My wife and I came and laid down on the table and we were both covered in a light. We got up and left, but the light stayed. We left from Zambia, but the light (understanding) of the gospel stayed with these saints. The brethren took this message that was brought to them out to other parts of Zambia, as well as to other parts of Africa. Brothers and Sisters, what a Mighty God we serve! Please listen to the messages, The Two Ands Of Saint John 2:22, Explaining Revelation Chapter Ten As John Saw It In 96 A.D. and Eating The Little Book. It was a humble little place there in Kalomo where God met with us. I praise God for the saints in Zambia. Explaining Revelation Chapter Ten as John Saw It in 96 A.D.